Boston was going through a rough time when we met him. There had been so many major life changes in his life ~ new house, new baby, new elderly family member moving in. Life became too much of a challenge for him. When pushed, Boston developed behavioral issues and was clearly an unhappy boy. In an initial evaluation, however, we saw a great potential in this young red and white Siberian. He seemed confused, however, was eager to please. We felt Boston had been dealt a bad hand in life and decided to work with him and give him a second leash on life. Boston has had his ups and downs over the last years. He continues to have issues, however, they are easily resolved with positive training and trading up. All in all, he is a good dog that is intelligent and affectionate. Boston has learned to play with the other dogs even though more often than not he thinks of himself as the “fun police”. He loves his crate, especially for stashing goodies – Boston is a known thief and hides his booty in his crate. When something is missing, we all know where to look! Boston is a welcome member of his foster home, however, it is feared that any more life changes would be too much for Boston. Due to his past issues, he will not be placed up for adoption and he will stay in rescue, loved and care for for the rest of his life. 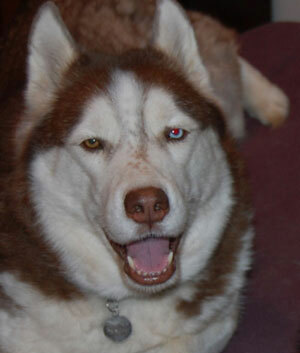 It’s hard to believe Boston has been with the MaPaw family for over six years! He is now nine years old! Moving to the farm was stressful for him at first, however, he quickly appreciated his larger play area and finding new spots in the farmhouse. He has slowed down a bit with a touch of arthritis, but still enjoys playing and acting as the “fun police”. He remains a thief and we never know what we will find in his crate… remote controls, phones, even a full size paper cutter. Boston is happy and knows he is loved and in a forever foster home.